New finds suggest that China and the West were in contact more than 1,500 years before Marco Polo arrived in Asia. Archaeologists say inspiration for the Terracotta Warriors, found at the Tomb of the First Emperor near today’s Xian, may have come from Ancient Greece. Researchers also say ancient Greek artisans could have been training locals there in the Third Century BC. Marco Polo’s 13th Century travel to China had been thought the first by a European. A separate study shows European-specific mitochondrial DNA has been found at sites in China’s westernmost Xinjiang Province, suggesting that Westerners may have settled, lived and died there before and during the time of the First Emperor. 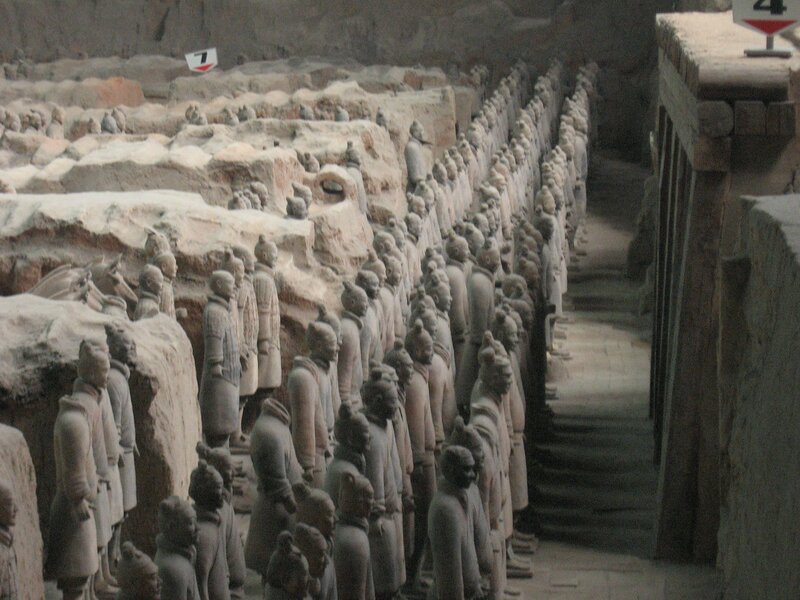 Farmers first discovered the 8,000 terracotta figures buried less than a mile from the tomb of China’s first emperor Qin Shi Huang in 1974. But there was no tradition of building life-sized human statues in China before the tomb was created. Earlier statues were simple figurines about 7.9ins in height. To explain how such an enormous change in skill and style could have happened, Dr. Li Xiuzhen believes that influences must have come from outside China. “We now think the Terracotta Army, the Acrobats and the bronze sculptures found on site have been inspired by ancient Greek sculptures and art,” she said. According to Prof. Lukas Nickel from the University of Vienna, statues of circus acrobats recently found at the First Emperor’s tomb support this theory. Lukas Nickel believes the First Emperor was influenced by the arrival of Greek statues in Central Asia in the century following Alexander the Great, who died in 323BC. “I imagine that a Greek sculptor may have been at the site to train the locals,” he said. Other discoveries include new evidence that the First Emperor’s tomb complex is much bigger than first thought and 200 times bigger than Egypt’s Valley of the Kings. They also include the mutilated remains of women, believed to have been high-ranking concubines of the First Emperor, and the skull of a man with a crossbow bolt embedded in it. The skull is believed to have belonged to the First Emperor’s eldest son, thought to have been killed along with others during a power struggle after the emperor’s death.